2017 marks the Centenary of John F. Kennedy’s birth and in order to celebrate the milestone of such an influential figure, The London Mint Office thought it appropriate to release these beautiful numismatic tribute. When John F Kennedy was sworn in as President on January 20th 1961 at the age of forty-three, he became both the youngest elected US President and the first to be born in the twentieth century. Kennedy had a close association with the United Kingdom and lived in London when his father was the US Ambassador. It is a little-known fact that JFK was actually in the House of Commons with his family on Sunday September 3rd 1939 during an emergency session of Parliament. The Kennedys sat in the Strangers Gallery to hear the momentous news that Britain had declared war on Germany and heard speeches from Prime Minister Neville Chamberlain and future Prime Minister Winston Churchill. The following year, JFK graduated from Harvard and published his thesis “Why England Slept” which examined the failure of the British government to prevent World War II. He then entered the Navy and in 1943 became a decorated war hero when his patrol torpedo attack ship (PT-109) was rammed and sunk by a Japanese destroyer at night. After the war, Kennedy embarked upon a political career that saw him enter the Senate in 1953. Later that year he married Jacqueline Bouvier and, in 1955 he wrote the Pulitzer Prize winning book Profiles in Courage as he recovered from a back operation. Five years later, he ran for the highest office in the land, and became the first Roman Catholic to be elected US President. At his inauguration ceremony on January 20th 1961 he famously challenged the American people to “Ask not what your country can do for you – ask what you can do for your country”. The arrival of an idealistic President and his young family in the White House instilled a spirit of hope and fresh optimism in the USA. He championed the cause of equal rights for all citizens, and was determined to introduce new civil rights legislation. Thousands of young people responded to his call by volunteering for the Peace Corps and working in developing nations overseas to project a positive image of America to the rest of the world. In August 1963, following intense negotiations, the USA, the UK and the Soviet Union signed the Nuclear Test Ban Treaty prohibiting outdoor nuclear weapons tests and pledging to work together towards complete disarmament. Just three months later, on November 22nd 1963 President Kennedy was shot and killed by an assassin as he travelled in a motorcade with his wife through Dallas, Texas. Crowds of people watched in horror as their youngest elected US President became the youngest to die. As the news of his shocking and senseless death raced around the world, people struggled to come to terms with the enormity of their loss. Today, the inspirational oratory, calm leadership and personal charm that defined the thousand days of Kennedy’s tragically short Presidency are fondly remembered by a world that continues to mourn his untimely death and wonder how different the world might be had he not been struck down in his prime. 2017 marks the centenary of John F. Kennedy’s birth and to commemorate this important milestone, I believe it is highly appropriate to mark the occasion with a beautiful numismatic tribute in gold. I do need to point out that the mintage limits on each of these coins is very low. I would therefore encourage you to act quickly to guarantee your commemoratives as these will sell out quickly. 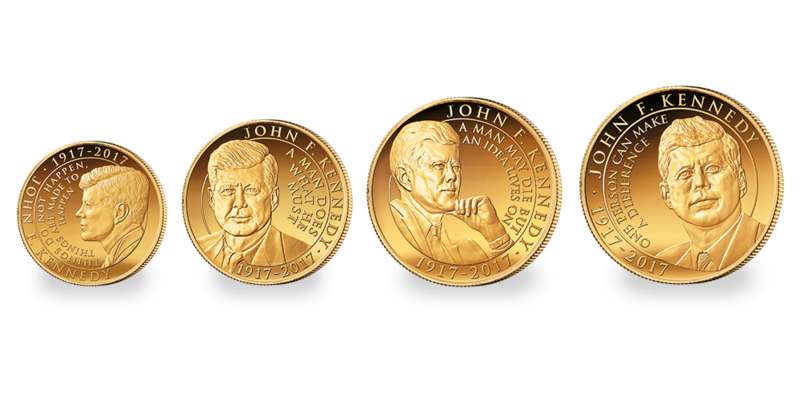 The exclusive range of sets and larger single coins will be presented with a commemorative book honouring one of America’s most beloved Presidents. Each coin will be struck to proof quality in 99.9% pure gold, making this a collection to treasure and pass on to your own loved ones. Coins featuring the portrait of JFK have always been high in demand so to avoid disappointment order yours now.